A cut of 54 per cent in direct greenhouse gas emissions has been achieved since 2006 by the Co-op, one of the world’s largest consumer co-operatives. The Co-op has reached its emissions goal three years early, the group announces in its 2017 sustainability report. The emissions reductions is one of a number of proudly reported targets reached during the year. The proportion of product packaging that is easy to recycle rose to 71 per cent, a figure the Co-op aims to increase to 80 per cent by 2020. During the year the Co-op became the only retailer to offer only British fresh meat. On public service, the group invested £29.7m ($39.6m, €33.8m) in the communities in which it operates. For the future, the Co-op’s objectives include understanding better the social value generated by its business, moving closer to the UN’s Sustainable Development Goals, and rallying more grassroots co-operation in the communities to campaign for change. Similar aims and claims are made by UBS, the Swiss multinational investment bank and financial services company. One target emphasized is to be the provider of choice for clients wishing to see financial investments supporting the UN goals and the transition to low-carbon economies. Already by the end of last year UBS’s sustainable investments passed 1.1tn Swiss francs ($1.1tn, £828bn €944bn), representing nearly 35 per cent of the group’s total invested assets. During the year its ethical investments in the integration category increased by 95 per cent and in third parties by 43 per cent. The figures are given in UBS’s annual report, its annual review and its document on activities aligning with the Global Reporting Initiative, the Amsterdam-based international body that helps organizations to communicate on climate change, human rights, corruption and related issues. 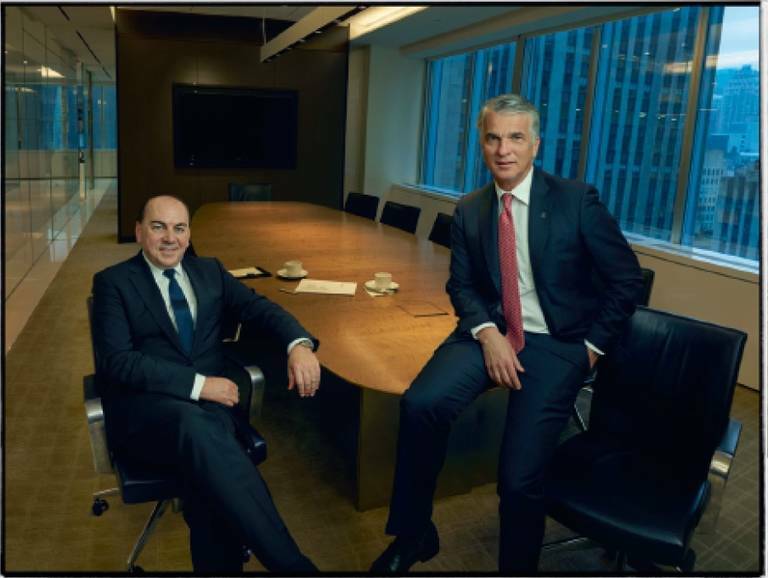 Chairman Axel A. Webber and chief executive Sergio P. Ermotti (above) write in their letter to shareholders: “We are strongly committed to being – and remaining – a leader in the field of sustainability.